Robert has the ability to sense media value and he knows how to turn those opportunities into valuable publicity like this half page feature article based on a phone call he received from a "thankful" grocery customer. The non-profit agency he represented received a huge exposure boost from his quick thinking. FRANKLIN - Of all those who provided comfort and companionship toJohn Brust when hiswife died last year, it was the bagger at the local Kroger who seemed to know just what to say. John Lynch, who's always there to share a joke with customers and offer a big smile, is a self-described Good Samaritan who clicks with all the Independence Square shoppers — but has bonded particularly with Brust. Brust, who moved to Franklin from Medina, N.Y., in 2002, developed a relationship with Lynch during the years he's been in town. Lynch would often walk through the store with Brust and his wife, Elsie, helping them pick out groceries and hauling their purchases to their car. The two Johns, who tease each other about having the same first name, discuss current affairs and religion on a regular basis. "I always laugh and joke with John," Brust said. "He was one of the first people who reached out to me when we moved here." Lynch, who has a slight developmental disability, is the kind of guy who never meets a stranger and is always eager to greet customers and carry their bags. "Everybody likes him," said John Thrower, a frequent Kroger shopper. "He apparently loves his job. He's a hard worker and stays busy all the time, laughing and joking." When Elsie Brust died, John Brust felt compelled to do something to thank Lynch for the kindness he showed. Brust's daughter, Cheryl Jacobs, called WAVES, an agency that provides support to adults with developmental disabilities, to see what Lynch needed. To show his thanks, Brust presented Lynch with a blue dish set and matching tablecloth. "He said so many wonderful things to express how sorry he was when my mother died," Jacobs said. "We wanted to do something nice for him." Lynch says being kind to people is "what life is all about" and that when Jesus was on the earth, he was kind to everyone and loved people, too. He said he watches gospel programming on television on Sundays to get information about God. 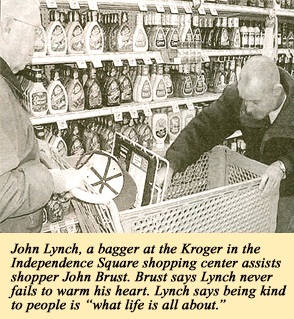 "I love Jesus, and I love people," Lynch said of why he is so kind to Kroger shoppers — particularly Brust. "What goes around comes around. If you do good for people, you prosper that way." Andy Pleiss, a manager at the Franklin store, said one of the things that makes Lynch stand out is his friendliness. "He does a great job," Pleiss said of Lynch. "He is probably the most talkative of the employees and all the customers seem to love him." Brust said, "Johnny's a good guy; he's always nice to me." "He's my customer," Lynch said. "My name is John, his name is John. We can't take that away from each other -- it sticks."